- Supports all iPhone screen sizes! - Apple Watch support for ideas on the go! - Use International Characters and Emoji! The Brainstormer is kindling for creative minds. A tactile tool to randomly combine a plot, a subject and a setting or style, the Brainstormer provides a moment of inspiration for writers, painters, or any creative mind. Combat creative block, spark new ideas and summon up quick subjects for doodling, sketching or journaling. NEW! Find Inspiration anywhere. The Brainstormer now supports the Apple Watch! 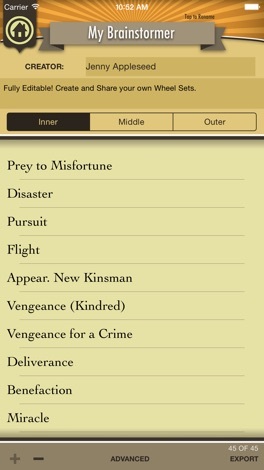 The Brainstormer has three spinning wheels featuring plot/conflict, theme/setting and subject/location. By manipulating the wheels -- or do a random spin -- you generate combinations that make fantastic creative prompts for writing, sketching or any creative activity. Edit the wheels: tweak the built in lists or create entirely new scenarios from scratch. More Wheels! 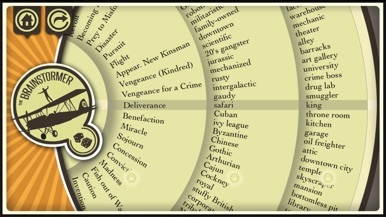 The Character Builder wheel combines of archetypes attributes and backgrounds, and the World Builder combines theme, mood and place to create one-of-a-kind settings. NEW! Sci-Fi Brainstormer generates ideas with a science fiction flavor. 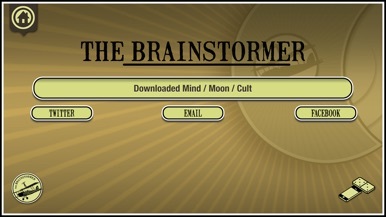 Please Note: The "Classic Brainstormer" wheel is included in the purchase price as always, and you can add the bonus "Creature Builder" wheel for free! Additional expansion wheels are available as in-app purchase, or you can share and get more wheels online! 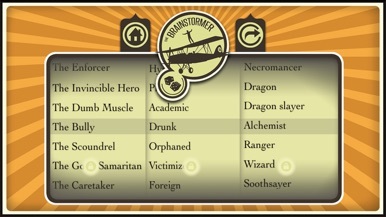 "The Brainstormer is a very attractive app that spins wheel to randomly combine plots, subjects, and styles. It's great for quick prompts or a new impulse." "The Brainstormer app provides a cornucopia of ideas for creative minds"
"Next time you're fresh out of ideas, give the wheels of Brainstormer a spin." • Time-tested and artist-proven, featuring the carefully curated ‘Classic Brainstormer’ lists. • Circular ‘Wheel Mode’ and linear ‘Slot Machine’ mode provides two views into the nearly endless combinations. • Shake your device or roll the dice for “Random Spin”. • Lock any of the wheels to fine tune your spins. 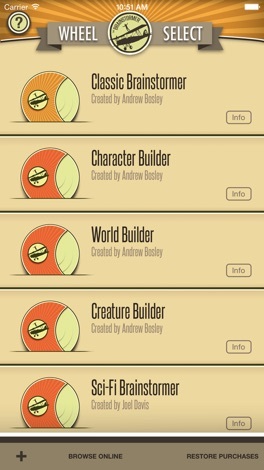 • Fully editable: Tweak the ‘Classic Brainstormer’ or create your own wheels entirely. • Export and Share your wheels with others via email, AirDrop and more. • Supports International Characters and Emoji! • Found the perfect combination? Send it via email or share it on Twitter and Facebook. • Apple Watch support for ideas on the go! • Edit your wheels in your browser over Wi-Fi. Like us on Facebook for News and Updates, and be the first to know about promos and new features! K-97 is Edmonton’s ONLY TRUE Classic Rock Station; with artists like Pink Floyd, Led Zeppelin, The Rolling Stones, The Who, The Doors, Aerosmith, AC/DC and more. Over 38 years in Edmonton; launching in May of 1979. Featuring Terry Evans in the Morning; an on-air fixture in the Edmonton Market for over 30 years.